Here are the questions that I want to start asking myself this year! This is a great article regarding the new national CCS and how they relate to the Special Education student. Read how the interpretations of reading and writing have been broadened. Even though there are still some issues that need to be clarified, the message is clear, "Special Education students deserve high standards and educators who know how to deliver them". 6 Technologies That Will Shape Education found in The Journal. 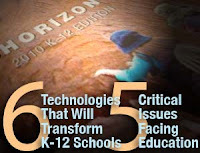 Check out the list of the 5 critical issues facing education as well. What are you seeing in your schools? Here is another amazing article as proof of how technology is transforming the way we teach! Here is the link to a press release regarding a new study of Dyslexia that is being published in the January issue of the journal Psychological Science. Researchers at Yale School of Medicine and University of California Davis, have presented new data that explain the relationship between IQ and reading. This link will take you to a Survey of K-12 Educators on Social Networking and Content-Sharing Tools. Please take a look around my blog. Besides my weekly postings, I have included many links to useful websites, educational news, and great blogs. Just scroll down the left side to preview all of the links by category. Don't forget to leave a comment too when you have a minute. Thanks for visiting! CEC blog at Teach Effectively!